These retreats book out quickly. $200 deposit* will reserve your place. RETREAT A – arrive 1st August and check out from the venue on morning of 10th. If you have a late evening flight that is 10pm or later it’s possible to arrange check-out on the evening of the 9th. Please contact me about this option. RETREAT B – arrive 12th and check-out from venue on morning of 21st. If you have a late evening flight that is 10pm or later it’s possible to arrange check-out on the evening of the 20th. Please contact me about this option. Connect to your joy, inner peace and creativity. Be the queen of your inner realm. Rediscover your creative self and the joy of experimental intuitive art-making. You will arrive before the retreat starts. The 1st day we will meet after breakfast for orientation, meditation, meet each other, and room set-up. The day will be a free day for you settle in, exchange money, buy whatever you need. We will have a communal evening dinner together and start the retreat program the next morning. BEAUTIFUL surroundings. No car access, green rice fields nearby, yummy organic cafe around the corner, quiet walks away from busy Central Ubud (yet only a 20-25 minute walk to town). The venue is a guesthouse owned and operated by a Balinese family. You will become part of the family while you are there. Gift yourself S P A C E away from your day-to-day activities and re-connect to the inner calm that aligns you with your true self and creative spirit. What would it take for you to live in your highest expression of happiness, love and joy? My intention for the retreat is that you gain a greater capacity to truly rest in the inner sanctuary of your being and recognise all the ways you can bring that into your daily life. This program has been lovingly thought out and designed to clear away the “clutter” of thoughts and re – ALIGN you to the divine presence within and all around you. What would it take for you to fully SHINE? You’ll re-emerge after the 8 days / 9 nights refreshed and rejuvenated with a deeper connection to yourself and others that invites a more joyful creative way of living. 9 nights accommodation in your own private deluxe room. Daily Morning Yin-Hatha yoga and Evening Yin Restorative Yoga. The practice is gentle, lots of stretching, and suitable for absolute beginners as well as experienced. Breakfast and Dinner home-cooked Balinese food on site. Oh my goddess, it is so good! 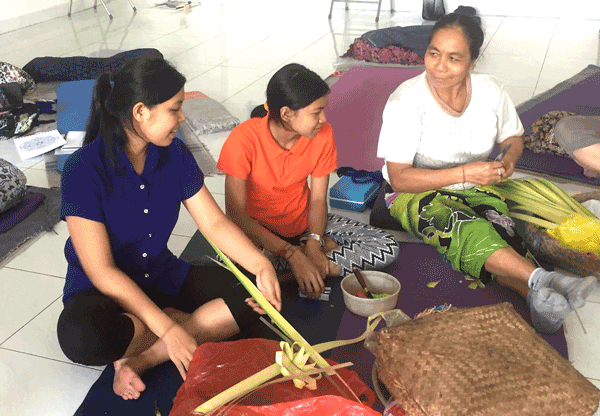 Learn how to make offerings with the Balinese sisters. 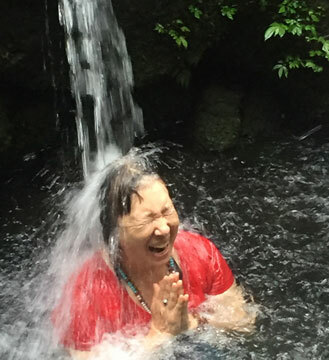 Excursion to Water Purification Blessing at a beautiful natural lush green water temple. Sound Healing – lie down and be immersed in diverse healing vibrational sounds to support the integration of letting go of the old and inviting in the new. Align & Shine Circle where we honour one another. Guided visualisations, journaling, sharing from the heart, creativity art-making exercises (no experience needed), contemplation, movement, sound, and mindfulness practices to support you in letting go of what no longer serves and invoke more presence and the ways of joy. 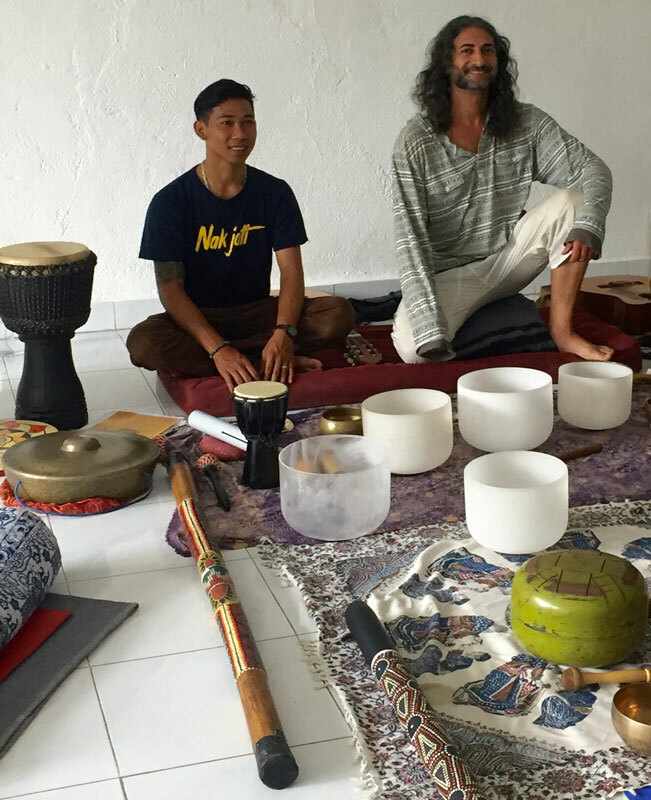 A day of art and play with Karja – internationally known contemporary Balinese artist. Even if you’ve never painted before and you don’t consider yourself an “artist” or creative person, Karja’s passion, fascinating life story, and skills as a teacher will guide you into his world of creativity and help you open into new unknown territories of creativity within you. Imagine a place and a space where you can be your own true, real, authentic and raw self. You are gently held as each day a new light dawns in your heart. Until, through all the purposeful and meaningful processes, your inner strength shines unhindered and free. Dive off the cliff, gorgeous soul, you will come home. It was initially challenging to give myself the gift of coming on retreat and my experience with Aesha and the beautiful women was so transformative. Deeply loving, connecting, restful, and blossoming. Thank you so much for holding such a loving sacred and allowing space. It’s a now a non-negotiable to join you again. I have a new circle of sisters now I’ll cherish forever. Aesha, where to start? There are not enough words to share how amazing I feel as we wrap up another BlossOm retreat. Thank you for your vision and calling to bring women together to create and thrive. I feel truly blessed. All Inclusive price includes 9 nights plus all the above (participants are required to stay the entire duration of the retreat). $200 non-refundable deposit will reserve your spot. Includes 9 nights / 8 days accommodation, breakfast & dinner, and all events listed above. One person per Deluxe room. You have your own room. Rooms are spacious, with mosquito netting post beds, big verandas, basic kitchen. You can pay your deposit with credit card through secure PayPal below (even if you don’t have a PayPal account). Or Direct Bank Deposit (Australia only) ask me for details here. Everyday of Aesha’s BlossOM retreat I felt like a queen with a nourished heart and soul. I thoroughly enjoyed every moment and had plenty of opportunities to submerge myself in the beautiful energy of Bali, its culture and its people. I felt honoured to connect with other like-minded, heart centred women and was able to safely express myself in a multitude of creative and inspiring ways. The retreat was the greatest gift to myself. Highly recommend. Thank you Aesha! Every single moment of my time, everyday was a new treasure. Such a rich and vitalising experience. A soft connection to this land and the Balinese people their spirituality. Ten days of my life spent in the best possible way – a rich treasure trove of experiences which will influence my choices for the rest of my life. This is my 3rd retreat. 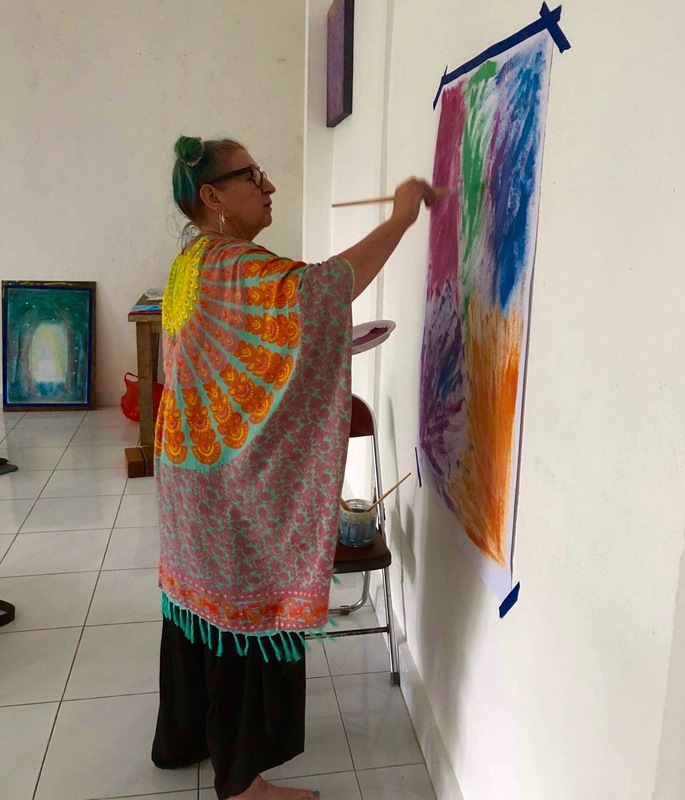 They’re unique amongst the many retreats offered for as well as yoga and meditation we do art, music healing, water blessings, and group activities. I treasure the profound relaxation and stillness achieved in each retreat. I was drawn to attend Aesha’s BlossOm Retreat in Bali 2018, and really knew that this was something I had to gift to myself. I had read such amazing things about Aesha’s retreats and felt really called to go- (it was on my Wishlist for a while!) And I’m soo grateful I did. This was such as powerful transformative process and I feel like I shifted so much stuff in such a small space of time. The heart blossoming, intuitive openings and healing left me returning to Australia feeling that this would need to be an annual pilgrimage for me- as it was one of the most powerful and enriching experiences I have ever had. The daily rituals and classes were just wonderful and added a beautiful variety way beyond a normal retreat- I particularly loved the chanting, charka work and yoga and the workshops that focused on creativity, sound healing and voice work- and working with the Balinese women to make offerings was a once in a lifetime experience as well as some of the unique journeys we got to go on with the temples! Aesha includes so many amazing activities that really put you in a gorgeous heart space- and the extraordinary women who came together and shared, sparkled and laughed- I loved them all and still miss them! Aesha’s local knowledge really makes this retreat extraordinary- you feel like you get to go beyond the average Bali tourist experience- and the accomodation and family that we stayed with were just so warm and wonderful- the food was awesome, and they went out of their way to make it a special time for us all. Afternoon naps over the fields on the daybed were a dream! My 3rd year running and it continues to nourish my heart and feed my soul. Aesha’s retreat is my annual fix of indulgence in the female spirit. An incredibly enriching experience with a group of supportive, wonderful women. Aesha’s ability and ‘knowing’ is an absolute blessing. Aesha is a skilled and loving retreat guide. This has been my second retreat here in Bali with Aesha, which in itself is testimony to how much I enjoyed the retreat last year. I highly recommend this retreat to all I know with an open heart and open mind who enjoy the company and connection that time with a group of women provides. Aesha, I write this from the heart. I had moments of grace, wonder, angst, sadness, peace and understanding over the 7 days and you watched over my emotional and chakra wobbles with wisdom and grace. I won’t forget. Thank you. 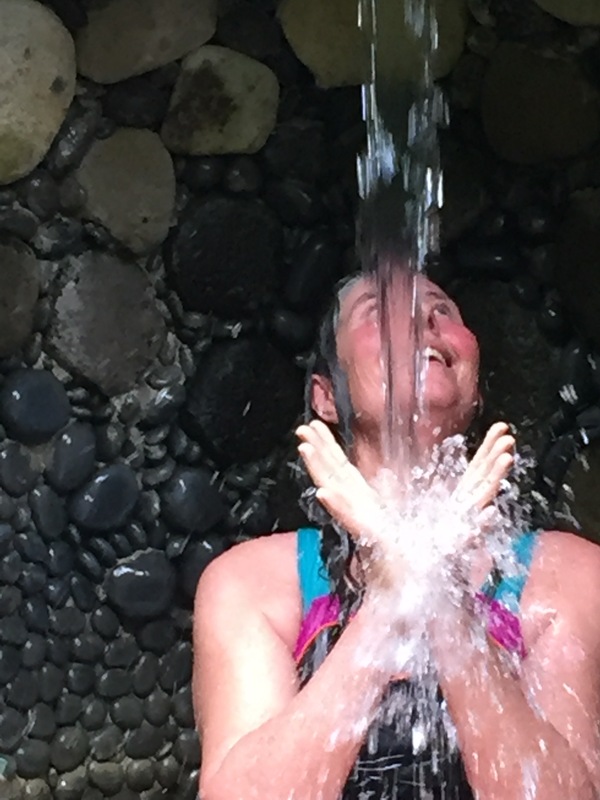 Someone who can call in 10 powerful women to share in 7 days of Bali bliss is a gift from the universe. Such a blessing. Thank you. After a traumatic year in 2015/16 this was a wonderful gift to myself. The retreat was everything I hoped for it to be and more. To spend a week with all these wonderful women, each on their own journey and with their own gifts to share, consolidated my growth and gave my new life a boost into the present/future. Everything has fallen into perfect place. Aesha has an amazing gift in creating a safe space, comfortable for reflection and growth. Thank you. The word Ubud in Balinese means “medicine”. This retreat is medicine for the mind, body and soul. Yoga is practiced twice daily with guided support. The family at Santra Putra Guesthouse provide traditional meals with love and care that are just wonderful. If you are thinking you need time to think and time to practice yoga and meditation you must come along to one of Aesha’s retreats. Highly recommended. I have been looking for a retreat for years and have finally found the best. Something I needed to do for myself to find myself again. I feel so blessed and will do this retreat again. You owe it to yourself as I have found. Thank you Aesha. “I haven’t done a “retreat” or “workshop” for many years. 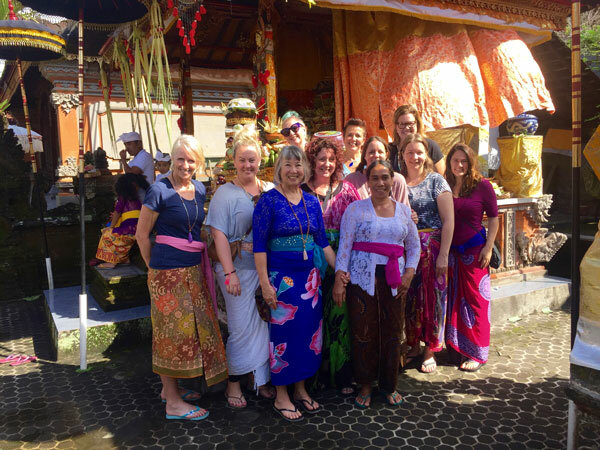 I am so glad that I was privileged to be present at Aesha’s first Women’s Retreat in Bali. Before leaving I had been feeling a bit stale. After that special week I was feeling totally refreshed. Yoga, meditation, creativity, yes we did. Relax, connect, create, share, yes we did. 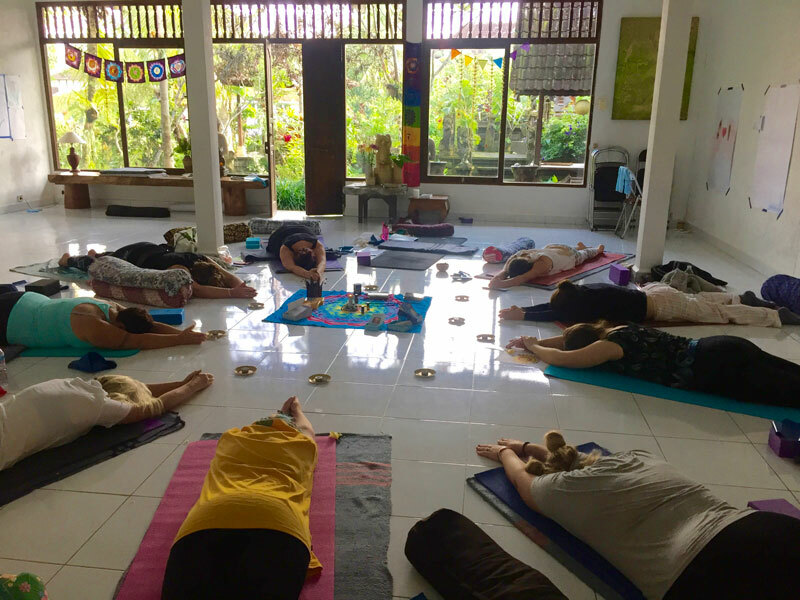 The location, the accomodation, the delicious local food provided, the Balinese family, the art class and other activities were all excellent but it was the small group of magical women that added that extra something. Thank you Aesha for holding us in a space that we could trust and expand in. I hope that I get to go there again.